Graduation – Electronics and Communication Engineer from College of Technology, Pantnagar completed in 2013. I started my preparation from June 2013 from scratch. So the article is especially for the students who want to start preparation from nil.One thing for such students that the key to crack this exam is ‘ya to tumhe padhai ki aadat ho ya fir yaha aakar daal lo’. Secondly, one should accept that this exam is a long journey. So patience is a very important factor. Thirdly, this exam can be cracked in an easier way with proper planning. For example, if someone pursues his optional subject in graduation this is an added advantage and will reduce her duration for getting selected. Fourth, regarding whether to go for coaching or not. Today the online platform has ended the guidance gap that was earlier prevalent due to coaching institutes. So, if you are planning for self study then go for it. 2nd attempt cleared mains but missed final list by 10 marks. 3rd attempt – 52nd Rank. The thing to learn from this is that the exam is an integrated process. Prelims, mains and interview shall not be seen separately. Preparation should be comprehensive. Don’t leave preparation after any stage . Preparation for interview should begin within one or two weeks of mains. We often think whether to write current affairs in optional or not, content of one paper in other or not. In my opinion don’t think too much. You have absolute freedom to write anything. Your over thinking can sometimes lead to curbing of your creativity. I wrote very cautiously in my 2nd attempt and I think that was the reason why my marks did not improve as per expectation. The people who check your sheets are intelligent and knowledgeable enough to understand. So be free to write and if you are writing something different then explain it. One question you should ask yourself before reading any book – if I don’t read this book will I get selected or not ?? If the answer is No then read that book. Eg. – Lakshmikant or Basu – it is very difficult to clear without reading anyone of them . Prelims- this paper has become much more tough because csat paper has become qualifying. So the luck plays a major role. Geo – gc leong or ncert for physical India ncert for physical and resources. Revise at least three times before entering the examination hall. Try to solve as many mock tests as possible. This will help in getting in depth knowledge and ensuring better memory. Go through previous year papers. Examine whether you know the answers or not. This will help in changing the way you read to the way that UPSC exam requires. Like initially we focus more on facts. 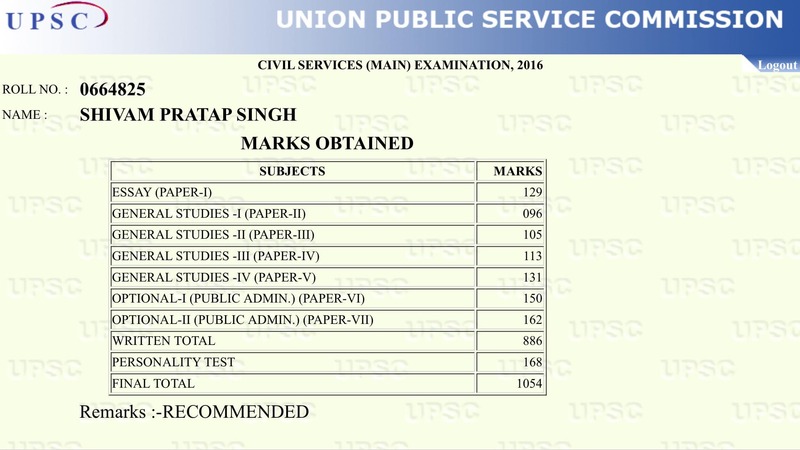 But gradually we have to change our pattern as per the UPSC’s requirement. One thing you can try is getting the pattern of the papers by going through previous year question papers. Similar thing was repeated in 2016 paper. So try to get the pattern to make intelligent guesses. It is very difficult to get exact answers for more than 40 questions. In rest of the questions, try to make as intelligent guesses as possible. Try to solve as many as mocks before Prelims examination. You can also refer to IASbaba’s 60 Days for Prelims and test series that has been very effective in this regard. In my opinion, mains require art of writing answers to articulate your knowledge. This is difficult for an engineering student in particular whose mind is trained to think objectively and get answers in numbers. The solution to this problem according to me is writing answers on a daily basis through any of the available websites. Don’t think that first you will gather knowledge and then write answers. Answer writing in itself is a process of accumulation of knowledge as when you compare your answers with the model answers, you will get one or two new points. And thus it will add up to your knowledge. By this process a large number of topics will get prepared. The other thing is how to make ur sheet different from others. I used to draw as many diagrams as possible. I am attaching my mains test series sheet. Hope this helps. post-independence India Take notes from any coaching. Indian society 11th 12th sociology. Answers should be written in general perspective and taking current examples. ministries departments Vajiram notes and newspaper . ethics and interface, family, society and all the hathodaatopics Have any notes or book and get the basics . I prepared this by mohanty sir’s notes . Thenafter try to write answers and frame your mind to write case study . In my opinion, this paper is not about right or wrong answer but about appropriate answer . case studies on above topics It is about mindset and practice. Try to write your complete analysis of case . Think that you are in that situation and how would an honest and compassionate officer react to that situation. 1) Paper 1 and paper 2 should be seen in an integrated form . 2) Go through previous year papers and write as many answers as possible. 4) Try to make notes of about 50 pages in short points. Your whole syllabus shall be covered in this. It will help you in revising whole subject in 1 day . 5) Write examples from current affairs . This reflects your understanding of subject. Regulatory bodies – a question is asked almost every year. 2nd arc has 10-12 pages on this. Please go through that. Public Policy: ignou notes , mohit bhattacharya and use as many examples from current as possible. Eg.- criticism of rational model – bihar prohibition law that was misused at ground level . In this paper one thing to remember is that your answer should not look like GS answer. So the solution to this is to use concepts of paper 1 in this paper so that it seems that the answer is written by student f pub ad. 2nd arc, notes and rajni goyal are sufficient for this paper. Public Sector Undertakings: Various reports and NITI AYOG measures. Plans and Priorities: Chapter is now almost obsolete. Prepare NITI AYOG nicely for this part. Rural Development: notes and rajni goyal for remaining topics . Which is the most difficult stage of CSE? Prelims, Mains or Interview? Why? I think mains is the toughest part because in prelims you have to choose the answer out of the four already given there but in mains you have to carve an answer out of the knowledge accumulated in your mind. Secondly the duration of 27 hours of writing is very tough. What is your message for the future aspirants of civil services? Work hard and have faith in Almighty. Ek exam kabhe ye decide nahe kar sakta ki aap life mai kya karoge, whether you get selected or not, it depends on a number of factors other than hard work. Be planned and execute your strategy. What is the role of family and friends in one’s success in UPSC? This exam is a big project. It requires support from many people. For me, my family played a major role in supporting me during my struggle. You will face a number of ups and downs during the preparation. You will feel demotivated and depressed but take it as natural. Fight it and try again. For this your family and friends can help to a large extent. How did you tackle the stress of UPSC preparation? You have the right to work, but never to the fruit of work – Geeta. Don’t take too much responsibility on yourself. Just keep on trying. During the low phases I looked up to my family and friends, and was fortunately encouraged by them all the way through. This exam is a locker with double lock. Open your lock with the key called hard work. Let God decide when he opens the other one. There are more than 10 thousand people every year sitting in this exam who can get under 100 Rank anytime. But people get rank because luck was on their side that day, and they had used their ‘key’ of hard work dedicatedly. Earlier I used to read right to education and right to information during preparation. But recently I realised that you get right to pravachan when you succeed. Finally, there is no ‘one best way’ to crack this exam. Take from my strategy as per your requirements and preparation status for which you are in a better situation to understand. IASbaba has been very effectively guiding aspirants in this journey with their initiatives. I would particularly mention about TLP Mains Answer Writing where quality questions are put along with the Reviews on the answers and Synopsis and Best Answer are provided. This can be very effective for aspirants preparing for mains. I recommend you all to follow TLP sincerely and seek maximum benefit out of it. I think the online platform has changed the scenario drastically, especially for the guidance gap that existed because of the coaching institutes. It should be your choice to selectively follow them and extract maximum out of it.